To support groundsmen, the following cricket grounds maintenance calendar has been supplied courtesy of Pitchcare. You are likely to find you may have accumulated some surface debris on the square on your return from Christmas break. 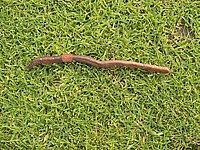 The sward will not be able to survive due to lack of light and could die, so it’s important to remove them. 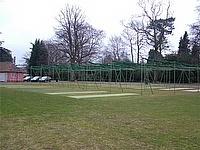 Many clubs often put up temporary fences around their squares to protect them. February sees the beginning of a number of activities such as, brushing, verti-cutting, mowing, light rolling and fertilising to prepare the sward/grass surfaces for the forth-coming playing season. Planning your workload will help you meet objectives. Squares require scarifying, rolling, mowing and marking out; not to mention your outfield which needs aerating, harrowing and raking. Start your pitch prepration 10-12 days prior to the first match of the season and following the guidelines laid out in April's maintenance calendar will result in a good standard of pitch. Your pitch preparations, mowing and marking will now be in full swing as the season starts to get very busy. 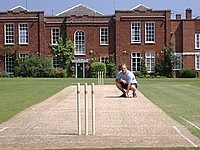 Follow the 10-12 day guidelines and try to produce a wicket that is consistent and offers fast medium pace. Make sure those lines are accurate and straight and begin the month by fully irrigating the square if you haven't done so already. You can help promote new pitches and re-establish old strips by maintaining consistent moisture levels. Uniform irrigation of the square is important as pitches come out of use. 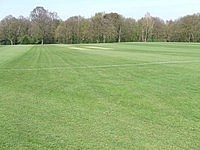 Regular mowing and scarifying of the square will need to be continued whilst preparing pitches, as you move through the month. Make sure your machinery is up to the task with regular service. As the curtain falls on yet another season, the weather for the start of October sees record temperatures around the country, reaching as high as 29.4 degrees in the south. September can be the busiest time for some groundsmen. Those who have a few weeks left of their season will be busy planning end of season activities, whilst others will be turning their attentions to more important issues such as end of season renovations. 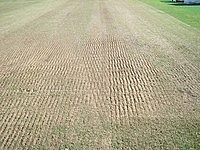 As summer time ends and winter begins, renovation programmes on cricket squares should by now have been completed. With the north of England and Scotland suffering from high winds and low pressure systems, the Midlands and Southern parts are basking in warm day time temperatures, which, continuing into October has certainly helped in getting germination on the square. Hopefully, by now, you should have managed to complete your end of season renovations and germination has been successful and any loam dressings will by now have settled down. It is important to go into the winter months with a good sward cover.